I have to admit it - I created a clothes monster. Billy Ray loves clothes. At the time of the adoption I was working in a large office. Several of the attorneys gave us cash instead of coming to the office shower. There were two other baby showers besides the one at the office. I used the cash to buy all kinds of little outfits. There were baseball jerseys with jackets that said "little sluggers", sweats and little suits for Sunday. Pictured to the right is one of his little suits that he loved. 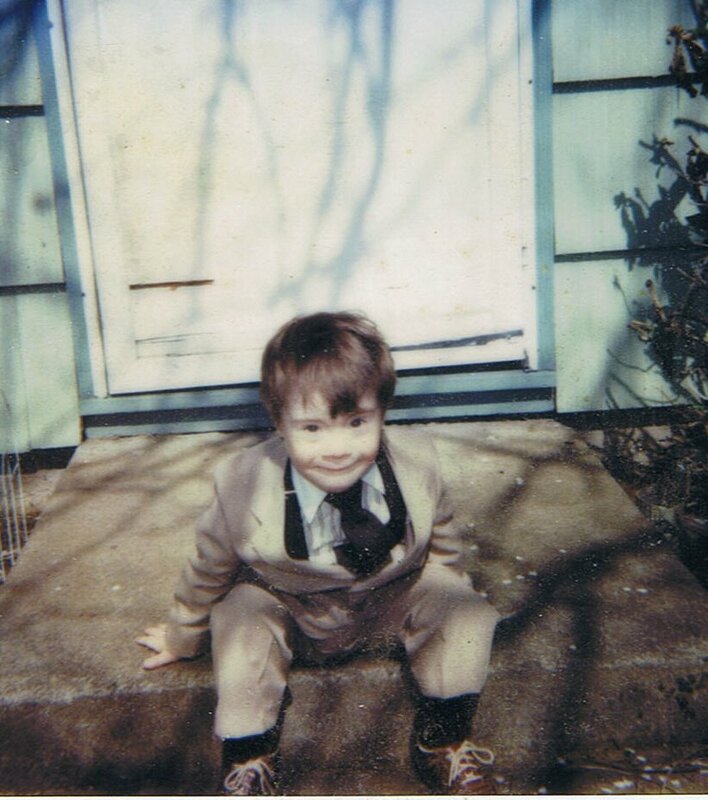 This is scanned from an old Polaroid picture but hopefully you can see the expression. It is one of my favorite pictures. He was about two and a half or three years old. In the first few years he was not too impressed by clothes. 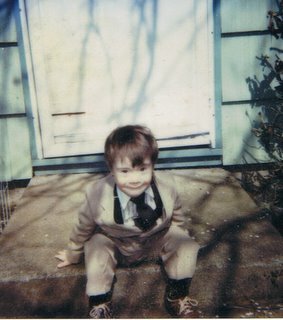 He had little suits that he wore to church on Sundays and would dress appropriately for school and play. However, when met my attorney and friend, Doug Harrison he wanted to be exactly like him. Doug wore suits everyday to work so Billy Ray wanted to wear suits. His obsession with clothes has continued to be linked to people he admires. I have mentioned before that he names his western slacks and white "cowboy" shirts "Koger" slacks and shirts. 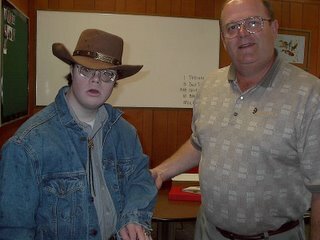 Here he is with Mr. Koger, his principal at Silverton High School. He is proudly showing Mr. Koger his high school ring. When he met our former pastor in Woodburn, "Pastor Ray" he wanted to be like him. So he wants suit jackets which he calls "Pastor Ray coat" and he wears it with "Koger slacks". 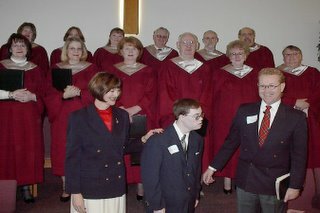 Here is a picture taken with Pastor Ray, his wife Christine and "my choir" on our last Sunday at Soul's Harbor in Woodburn. Note he can't take his eyes off Pastor Ray even to get his picture taken. 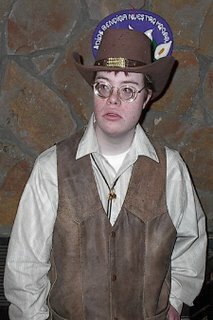 He also loves his "cowboy" outfits since we moved to a rural area where that was pretty common attire. He prefers one type of clothes for a while and then switches to what he wants. New clothes are fun but often are only worn once and put in the closet. He is difficult to fit especially with his desire for things that may be out of style or discontinued. An example of this is jeans that had a design of a bulldog embrodered on the pocket. The jean manufacturer quit making that style and nothing else will do. Eventually we found some other jeans with the same blue thread with a different design. He still thinks they are "bulldoggy" jeans but accepts them. They are now worn out and way too tight. Presently we are in a real dilemna because he gained a lot of weight with his diabetes and nothing really fits. We have several things saved from when he gained weight from a medication he used to take but he is not having them. He does like flags because of his "Bubba Mike's" recent service in Iraq. He will wear some "Army" looking outfits or things with flags for a day or two but then still wants to go back to his own favorites. Basically we need to remove all of his old things because they are too small and start again. Figuring out how to get him to accept new things even if we could find exact duplicates is challenge. He does know the difference somehow. Given the difficulty in finding things he likes the problem is multiplied. Welcome to our world (smile). When we figure this one out I will share our progress.